At different points in our lives, our living situation might not be ideal for having a bunch of friends over to play games. It could be the case that your place it too small, or you have unwelcoming roommates, or you obsessively horde old newspapers. Whatever the reason, you are forced to find other locations to play games. For this week’s CMON Feature Friday, we take a look at some of the other venues that you can take advantage of to get your gaming on, as well as share some tips on how to get the most out of those locations. A local coffee shop is a great place to play board games. They are used to people coming in and working on their screenplay for hours on their laptops, so a lengthy game shouldn’t be a problem for the staff. Keep in mind that coffee shops are places of business, so if you’re taking up a couple of tables for hours on end, make sure to make a few purchases during your time there. Also, remember that some people really treat a coffee shop like their office. It doesn’t mean that you can’t have a conversation or a good time while you’re there, but be considerate of the other people using the space. A board game café may not appeal to the average hard-core gamer. For one thing, you might have a collection of games that dwarfs that of a small café and resent the need to pay to have access to theirs. 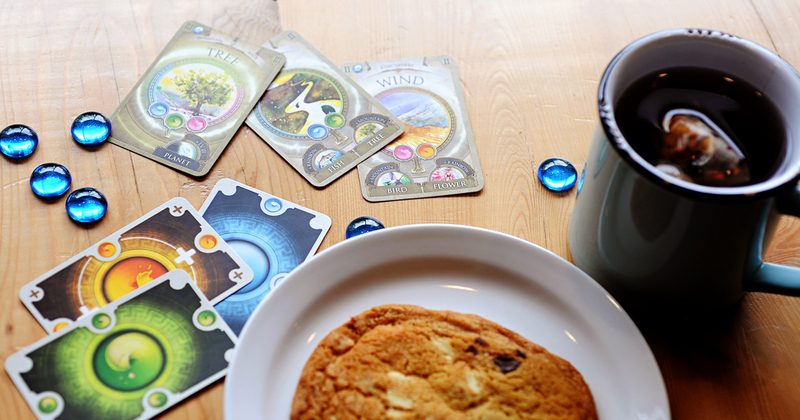 However, board game cafes have a lot of advantages over a regular coffee shop. They are literally designed for playing tabletop games. They have staff on hand who can assist with rules questions. They expect you to stay for long periods of time and play games. They will bring food and drink right to your table and clear it away when you’re done. This leaves you free to concentrate on the important things, like crushing your competition. Pubs can be a good place to game, but there are a few things to consider. They will generally have low lighting, so consider games that can be played under such conditions. Patios can solve the lighting issue, but then you have the (gasp) weather to contend with. The biggest thing you have to concern yourself with in a pub is spills and general stickiness. They’re not always the cleanest environments, and due to the imbibing of libations, people tend to be a little more accident prone. Durable games are a good choice if you’re going to try some pub gaming. Now, I’m not suggesting you walk into the middle of a crowded public library and plunk down Blood Rage for a rousing game of Viking conquest during Ragnarok. At best, you’ll get some weird looks, and more likely a librarian will slap a meter stick down on the table ending your fun and scaring the bejeezus out of you. However, many libraries do have programs that allow for gaming in separate rooms or after hours. You could even start your own, if such a thing doesn’t exist in your local branch. Speak to the librarian and see if there is a program, or if they’d be open to the idea. Libraries are public spaces, and sometimes you can use them in creative ways! Ok, now we’re getting into some obvious territory. One of the great benefits of a Friendly Local Gaming Store is that they will often hold regular game nights. Usually for free, you’re able to show up and try out games before you buy them. Sometimes, they will hold special events or game nights. Other times, it’ll just be open gaming where you can select games from their library. FLGSs have knowledgeable staff and are pretty good at finding games that would work good for you and your groups. If you do take advantage of the benefits of an FLGS, try to pay it back by buying some games there. It helps to keep them going, where they can provide a place for the gaming community to come and enjoy the hobby. Well, this is probably the easiest option to fulfill. As gamers, many of us love to host game nights, so it’s usually pretty easy to find someone who’s willing to have the party come to them. If you’re going to game at someone else’s house, try to be aware of their house rules and respect them. This doesn’t mean they get to pick every game and boss people around, just that you should respect that it’s their place. A good guest never arrives empty handed, so whether you arrive with that new hot game, a bag of chips, or two liters of Jolt, it’s nice to bring something to the table. It goes a long way to ensuring you’ll be invited back again. With all these different options out there, there’s never an excuse to not game when you want to. The best is to have a number of reliable gaming locations that you can tap into when you get the chance. Where do you like to game when it’s not at your own place? We’d love to hear about options we didn’t cover here. Reach out to us on Facebook and Twitter suing the hashtag #CMONFeatureFriday and tell us where you game!